Some time ago I mentioned that I was looking to replace my 2006 1.4 Polo Trendline. 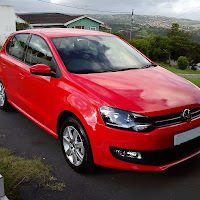 In January this year I bought the new Polo 1.4 Comfortline. I’ve decided not to review the car at this stage but rather inform you of the problems I’m having with it. If the issues are resolved there will be an unbiased review done on the car. As stated in an earlier post I had issues with my previous Polo, where the computer box eventually had to be replaced after six months of trying to find the fault. However considering the problems with the previous Polo, I decided to give VW another chance, thinking that it can't happen twice. But I was wrong. There is a problem with the new one as well. The problem is when taking off from a standstill the car doesn't have enough power to launch. You have to over rev it to take off and on inclines it's worse. The car went into McCarthy VW at 2000kms and they reloaded the software, but that didn’t resolve the issue. I booked it in again at 10000kms and after a day of testing VW said that there’s nothing wrong with the car. When I went to pick my car up that afternoon I told the service manager to jump in the car and I proceeded to show him the problem on a ramp that goes up to the service centre. He tried it as well and said that I should understand that this is a 1.4 and I shouldn’t expect it to have a lot of power. I said ok, let’s try another 1.4 from the VW floor. 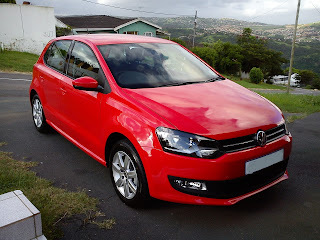 So we jumped into another 1.4 Polo and proceeded to perform the same test, i.e. taking off from a standstill on the ramp, low and behold this one took of perfectly without over revving, and it didn’t struggle, it kept on accelerating up the ramp. The guys at VW eventually admitted or realised that there definitely is a problem with the car. They said that they will have to get a factory inspector to have a look at the car, so the car is in again at McCarthy VW and we are awaiting results of further testing that they have been instructed to do. I’m anxiously awaiting the outcome of today to see what the issue really is. I will be posting the progress of this case, so be on the lookout. Let’s see how VW handle the situation this time around. So far the staff have been polite and no harsh words have been thrown about, but remember that this is visit number 3 for my Polo and it’s only done 11000kms. 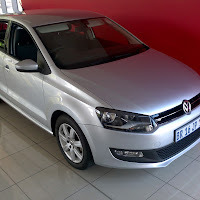 Upon picking up my car from VW on the last visit I was told that all the part numbers on my car were taken down and was going to be submitted to VW SA to check if they are defective. I had to contact McCarthy VW today, after not hearing from VW for a week, to check on the progress of this. I was told to bring the car in next week again for a diagnostics test. This will be visit number 4 and the car is doing 12500kms. Took the car in for another test today and I brought up another problem that came up with the VW mechanic, Strini. The problem is when in 3rd or 4th gear and the car is accelerating flat out there is a flat spot when the car reaches 4000rpm. Strini drove the car and also confirmed this. But the flat spot is so slight that the diagnostics equipment couldn't pick it up. The problem with the lack of power on take off is still not sorted. Strini is now going to arrange a few other 1.4 Polos to compare with my car to see if this is how the car actually performs. This concludes visit number 4, the car is doing 13100kms. My car went in for it's 15000km service yesterday. I told the service manager that the problem was still there. When I picked it up they told me that they couldn't pick up any problem. So I said lets leave it for another day. As I was driving home I tested to see if the problem was still there. And it seemed to have dissapeared. But I'm not going to be too hopeful, let's see after a week if it comes back.